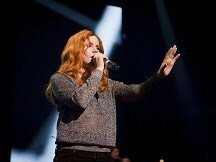 Katy B would love to appear on stage with Alicia Keys. The singer, whose debut album On A Mission is in the running for the Mercury Prize, is keen to make music with the Empire State Of Mind star. "My dream collaboration would be Alicia Keys, definitely. When I was younger I used to play the piano and when she came out I was like, 'this is why I've been learning the piano'. "Because I just wanted to be her, I bought all her scores and I used to write my own songs on top of her chord sequences and stuff like that." And while Katy, 22, revealed she planned to dress to impress for the Mercury awards show on September 6, she insisted image isn't everything to her. "When I was in bands and going on stage I didn't really think about it that much, for me it's more about the music, definitely. "I think for some artists the way they dress is a big thing about how they express themselves. But I just like to feel comfortable on stage really, I like to jump around and run up and down and that sort of thing."